Recently, I have succeeded in taking my bevel forging to a much finer degree. The "fatter" version shown below is what I was able to do the past few years. It is actually quite good for a forged bevel. However, the edge is really a little too thick, leaving a bit too much for the final microbevel. After a bunch of trying some refinements, which includes an entirely seperate and extra forging step, I came up with a way to accomplish an extremely fine bevel and cross section. It may not seem like much of a difference, but it is. The fine edge is truly ready for an amazing microbevel. And the really great thing is that fine bevel was done by very aggressively forging (thus packing) at the edge during the last heat, to give the edge the best toughness and edge holding. I believe this is the ultimate in a forged blade! Very few blades are forged at all these days. With modern steels readily available in flat sheets, they are quickly cut to the shape of the desired blade. High powered electric grinders finish by shaping the bevels. That's not how I do it. Although I have always forged all my blades from round bars of high carbon steel, they have required a fair bit of stock removal (grinding) to shape the bevels. For many years I wondered about forging the bevels all the way to a wire edge, to seriously pack the steel there (and to avoid all that grinding). The few attempts I made failed miserably because I couldn't control the edge, which would weave all over. Then one evening a few years ago, an idea struck me that should solve that problem. After a lot of refinments, I finally got it to work, and it has transformed the way I make my blades. The final forging is done so precisely that no major stock removal is needed. This keeps the full benefits of the forging. I am enjoying the thought that I've possibly taken a big step backwards to the time when precise forging of blades was needed because a lot of shaping by grinding was not an option, so bladesmiths had to be very good to make the best blades. "Hand forged" can mean a lot of different things. Usually, the bevels are started to be forged but with plenty of metal left so that the heavy grinding will correct all the irregularities, to finally give a nice, uniform, clean bevel. It's easy to tell by looking - the bevels have no scale or forging marks. For decades I thought that was the only way, that it wasn't possible to forge the bevels all the way to a uniform and fine edge. So that is what I used to do. Done well and with good steel (and heat treatment!) - it produces good blades. It's the reason a very old argument in bladesmithing has gone on for so long without a clear "winner" - Is a forged blade any better than one cut from flat stock? Well, when the bevels are not very thoroughly forged, the difference is not very great. THAT is where my new blades differ. The bevels are forged all the way to a fine edge, the entire length. The proof that this is true is easy to see - there are no grinding marks on my blades, there are forging marks. I continue to strive to do things that other knife makers can't or won't do. The edge of a splitting maul can be made razor sharp; but you wouldn't want to carve wood with it because, although it is sharp, it is too blunt. The finer an edge is, the easier it pulls through a cut, but the more quickly it will dull (or chip, if it is too hard). The challenge to the knife-maker is to provide the best steel, forging processes (assuming the blades are forged at all) and heat treatment to yield as fine an edge that will be tough. This has been a major focus of my work. I've developed a process that allows me to use an incredibly fine 10 to 12 degree primary bevel with a 4 degree micro bevel at the very edge. Because of this fine bevel, my tools cut much easier than most carvers are used to. 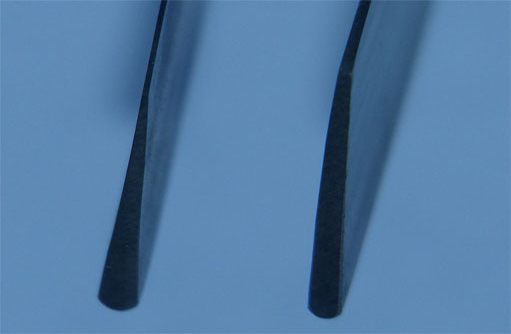 Another benefit of this bevel geometry is that it also allows for quick and easy sharpening, because very little metal needs to be removed (ie. the micro bevel). There are several reasons why these blades, even with edges that fine, stay sharp so long. (Several of my customers have told me they have never sharpened my tools, even with many hours of carving.) I start with the best grade of high carbon tool steel and forge it with dozens of repeated hammer blows. This refines the grain structure. The final forging "packs" the edge. Although I try to leave as much of the forging marks as possible, the final buffing (especially along the micro-bevels) removes some of them. The most important process to give the blade the best edge holding possible is the heat treatment. This is a two step process. The hardening is done first, by bringing the steel to just the right temperature (too hot results in grain growth, but it has to be hot enough to harden) and quenching in oil. The blade is now very hard and brittle. The second step, tempering, relieves the stresses and results in the final hardness. The critical (and little known) fact about the tempering is that it is time dependent. I continue to be amazed that many well known knife makers perform their tempering quickly, when I know it should be carried out over several hours. The molecules in the steel need more time to transform to the proper tempered state. My tempering process is the same as the commercial heat treaters, tempering hugh gears and shafts for engines. The blade must be held for at least a few hours to achieve the full benefit. Pictures above show the bevel on the bottom of the blade. The bottom bevel is most important because this is the bevel that contacts the wood being cut. This geometry allows the blade to round through a curving cut (such as hollowing out spoons and bowls) without chattering. 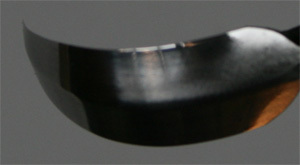 It is difficult to carve out the insides of rounded surfaces with bent knives that are flat on the bottom (ie. no bevel on the bottom) because they "chatter" or jump as they are made to try to round through a cut. are quite versatile, used equally well right-handed or left-handed. There is no right or left handed version - one tool instead of two. They are also "bi-directional". When the grain changes direction (at the bottom of a bowl or spoon, for example) there is no need to change tools or position, just use the other edge to carve in the other direction. 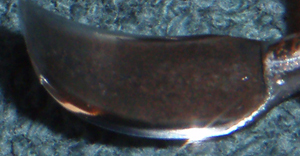 The typical way the bent knives are used is with one hand, palm up, the thumb on the far end of the handle, and the work piece held in the other hand. In this way there is no need for a clamp or vise to hold the work (and have to reposition). By using the whole arm (not just the wrists), very powerful cuts can be used to remove a lot of wood quickly. 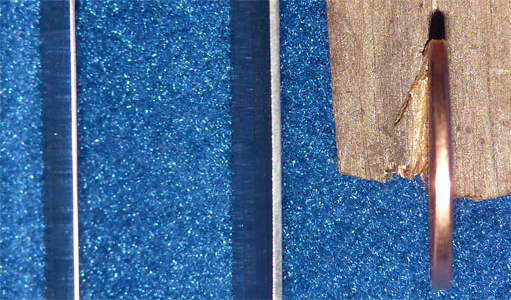 Shearing cuts (where the edge of the blade is at an angle not 90 degrees to the direction of cut) allow for assimilation of a wide variety of radius cuts. This is not generally the case with gouges which are not usually used for shearing cuts. Bent knives are at home in just about any kind of cut (except against the grain - just use the other edge!). other directions. Somewhat flattened bottom, so they won't roll. My straight knife handles are very similar, just a bit shorter.